Looking for an adventure by sea? Sailwiz connects skippers with travelers to share journeys around the globe. Explore our plans and make yourself a Sailwiz! Patrick was very kind during the whole trip and, above all, is a very experienced skipper that made all us crew members feel safe. Also the food on board was delicious, like made by a french chef. Already have a boat and need sailors? Sailwiz.com is a platform for shared sailing holidays that connects skippers and boat owners with people who wish to go sailing, but lack the knowledge and means necessary to go sailing on their own. Our goal is to make nautical tourism accessible to everyone by offering cabin charter options. If sailing interests you, you no longer need to buy or rent a boat. You also don't need to be in possession of a boating license or even find a crew to accompany you. What is special about Sailwiz's sailing holidays? With Sailwiz.com you just have to worry about choosing the plan that you like most and booking your spot. You can travel with your friends or embark on an adventure to meet new people. You can also ask us about custom plans and we will try to adapt to you. All Sailwiz plans include a skipper. The cabin charter plans range from day trips to see the sunset or go fishing, to several days, for nautical courses, coastal voyages from port to port, full-week itineraries on board or a flotilla. How can I book my sailing holiday? Any user registered on Sailwiz.com can book their spot by paying with a credit card or bank transfer. Once the payment is completed, the skipper receives an email notifying them of this booking and the information of the crew members. At any time before or after the booking, users can contact the skipper and ask them any questions. Should there be unforeseen changes for the date of a scheduled trip, once the minimum number of spots are covered, the user can give up their spot to whomever they wish, without additional charges. Sailwiz will manage the change and communicate the details of the new user who will be on board to the skipper. What destinations can I travel to by boat? At Sailwiz we are constantly working to expand the number of destinations and the types of experiences we offer, but currently we have plans to sail along virtually the entire Spanish coast and islands. We also have holidays in other parts of the Mediterranean, the Caribbean and even in the Indian Ocean. What is most valued by users? Sailwiz users especially value the ease of booking a boating activity, in merely a few steps and with substantial information available. There is also the opportunity to find out any missing details by contacting the skipper of the experience directly, so it is possible to resolve any doubts about the trip before booking. Another of the most important factors is the experience with the skippers and, in most cases, the crew members enjoy an excellent experience with the person in charge of the trip. Skippers are often experienced sailors and can provide great knowledge about sailing and about the destinations they visit. 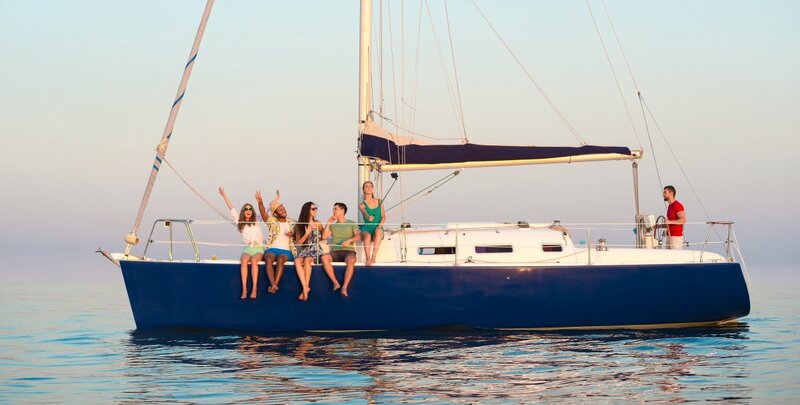 Another advantage of booking a cabin charter experience with Sailwiz is the opportunity to meet people who share the same hobby and which often results in great company to spend the vacation with. More often than not, crew members end their trips with new friends.